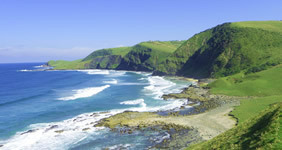 Get the best out of the wild coast by exploring this beautiful region on foot. 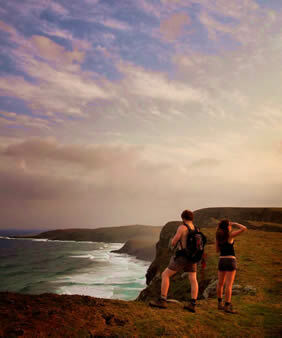 The Central Wild Coast can easily be explored on foot, and one does not need to be a sports freak in order to do this. The hikes are fairly easy and each leg of the journey - from one backpackers to the next - takes about 4 to 5 hours. The fantastic thing about this hiking route is that you don't have to do the whole route - you can hike only one part and visit only one or two of the backpackers, or you can stay as many nights as you wish in any of the in-between backpackers before continuing your walk. As a special service to you, we offer free luggage transfers from one backpackers to the next. Time for you to get those hiking boots on and start walking! Make sure you book your accommodation and dinners a day or two ahead. These are small backpackers that don't have restaurants (with food on demand at any time of the day) but they do provide yummy meals IF you book ahead, so let them know you will be having dinner with them! Heavy luggage can be shuttled from one backpackers to the next - ask at reception for luggage transfers. They are free! There are no shops on the hiking route - take a sandwich and some fruits with you for your hike. The only in-between place where you can get a meal is at Hole in the Wall Hotel. The backpackers will provide lunch packs on request (order the day before, please). Take some water with you. If you run out, you can ask at any local Xhosa hut for drinking water (usually rain water). "Ndicela amanzi" is the polite way to say "I request some water". But pointing at an empty water bottle and smiling will also do the trick. You can hire a local guide if you don't want to walk by yourself. We recommend to walk with a friend at least, for personal safety. 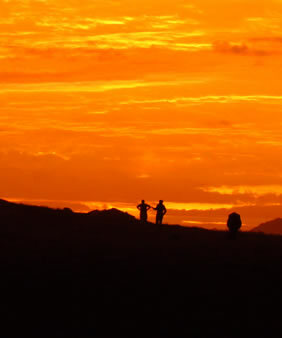 Ask the backpackers reception about booking a guide and rates. The hikes are not very difficult, but there is a quite a bit of uphill and downhill to contend with. Check the tides! Each hike has a river crossing that can be difficult at high tide. You find a tide table here - Coffee Bay Tides - and they also have a great weather forecaste for the Coffee Bay area - Coffee Bay Weather. out and call their dogs off). Go down to Mapuzi river and down hill to the left to the pebble beach. Cross a low river and head up the 4x4 track. At the top of this big hill keep to the left on the footpaths on grassy hills. Next hill up you will see a rock with white arrow, follow, and hills evens out and down a bit where you look over Coffee Bay beach now. Dense forest with steep hill down, look carefully for the entrance and follow the path. 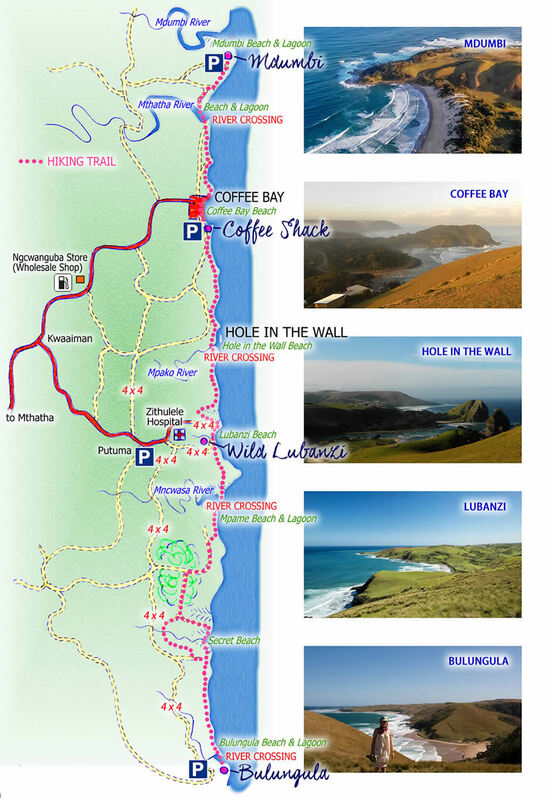 Once at bottom follow the white arrows and enter Coffee Bay beach on the rocks. The forest path is only possible at low tide. If arriving at Coffee Bay at high tide, from the 4x4 track keep on the gravel road till you meet up with tar road, then head into Coffee Bay. Hole in the Wall. You can walk on the hilltops along the coast or on the gravel road, as you prefer. There's a hotel at Hole in the Wall where you can have food and drinks. Find a river crossing - check low tides! After the river, climb up the hill and down on the other side. Up the next hill - follow the coastline for a while, then skirt the one steep gorge and come out towards the coastline again. 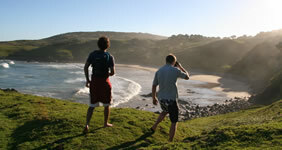 Walk down the hill, cross the beach, and walk a little bit up the road to find Wild Lubanzi Backpackers on your right. From Wild Lubanzi Backpackers, walk straight across the hills to the gravel road, walk past the sand pit and down to the long beach. Find a river crossing. After the long beach, walk up the hill a little bit to find the gravel road. Follow the gravel road, along the right angle bend and a fairly steep uphill. On your right, there's a clinic and a school with a fence around them. After the clinic and school, take the first road to your left. Follow the path to the next T-junction, then take the path to your left again, heading out towards the sea again.The path gets smaller and smaller until you reach the hilltop overlooking the sea. 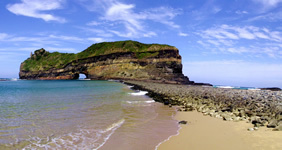 Climb down the hill to the little secret beach.Up the hill on the other side - walk on the hilltops for about 500m, and then you should be able to see Bulungula Lodge in the distance.Drop down to the beach again and follow the beach until you reach Bulungula River. Find a river crossing.